Our 212˚F Condensate Return System assures full capacity return to boiler of steam condensate under open trap, boiling water conditions. Low silhouette assembly permits full drainage of low return lines. All units equipped with Roth patented pumps guaranteed to deliver full rated capacity at one foot NPSH. 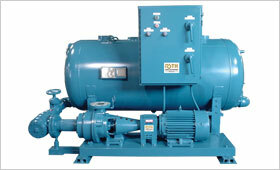 All pumps are full ball bearing design without internal water lubricated bearings. For capacities to 190 GPM and heads to 175 ft. TDH at 1750 RPM.